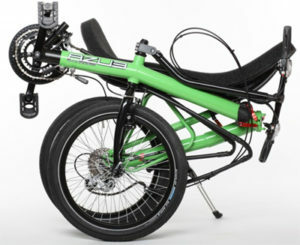 The AZUB Origami is a city-friendly recumbent bike that folds for easy storage and use with public transit. It has many fitting and color options. 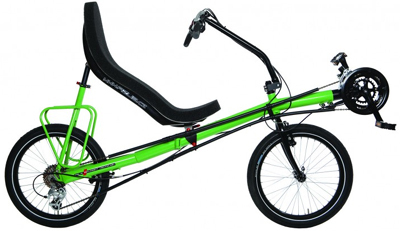 Folding recumbent bikes like the AZUB Origami are rare. Reasonably so, since demand is still small. The Origami is purpose-built for practical transportation. 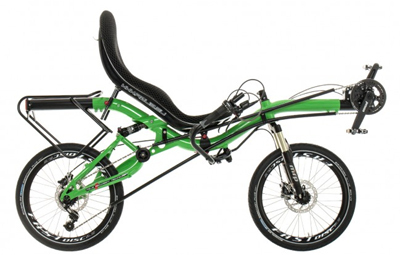 Rigidity for tough climbs is good, and it has modest cargo capacity built in. Plus, the frame folds small enough that, with its seat, it stows in a canvas bag to lug onto transit. Alas, this kind of user does not represent most of our customers. But this kind of user is pretty cool, and if that is you then look closely at this bike. The Origami is the folding version of a bike AZUB called the Eco. AZUB doesn’t make the Eco now, and they only sold it in the European market. It targeted the practical cyclist, with good city manners for stopping, starting, and maneuverability. People with appreciation for this riding will like the Origami even without folding it. Our sales manager Micah fell in love with the Origami and added so much stuff that it doesn’t fold any more. But bikes are serious transportation for Micah. He also has this juvenile habit of passing people on racing bikes, and the Origami has worked out satisfactorily for him. Indeed, he’ll talk your ear off about it. Beware. Our Price: Varies greatly by spec, but most from about $2900 to $3200, with some in the $4800 area. A recumbent like AZUB Origami will be very hard to find anywhere in the world. The long wheelbase and tuned geometry of the frame give it excellent riding properties both in slow pedalling through a city and in fast descents. You will also be pleased with the array of smart solutions there are, such as the possibility to secure the bike after folding, the integrated rack or the space under the seat to fit a specially designed triangular bag. Not to mention the folding system that turns the Origami into a small bag easily transported by car, train or even plane. In short, the Origami is just right for small spaces and it does not really matter whether you come across them while weaving through a city or looking into the boot of your car. 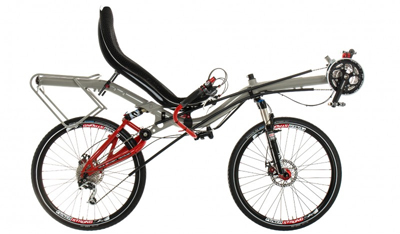 In 2008, we attempted to make a cheap recumbent. We wanted to offer the pleasure of the riding comfort of recumbents to be experienced by people in countries where incomes are not so high. That is, in our country, the Czech Republic, Poland, Romania or Hungary. 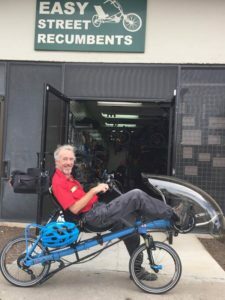 We devoted a lot of effort, time and money to this project and managed to create some interesting prototypes, including a steel recumbent without suspension with a 20” front wheel and 26” rear wheel. Eventually, our favourite aluminium and the “dual 20” model won. AZUB ECO 20 was an excellent stable bike which was also very easy to handle thanks to its compact dimensions. It was also exceptional due to its interesting features, such as the beautiful adjustable aluminium seat. We also made several models with 16” wheels for children or for small people. Although not much interest came from Eastern Europe, there was some from France or Japan. Nevertheless, we have never wanted to spend our time thinking where to cut corners in order to reduce the cost, so soon we began to improve it instead. The last step was adding a folding mechanism, thus turning the AZUB ECO 20 into AZUB Origami. 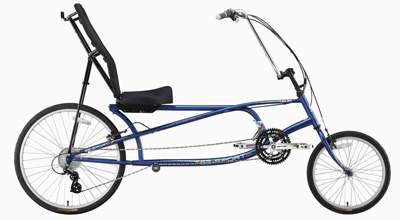 A recumbent small in size yet large in riding properties. This is an impressively wide range. It will not go truly bolt-upright, but shell seats don’t do well sitting too upright. The handlebars on the Origami are less adjustable than other AZUB bikes. There is only OSS steering available, not USS or open-cockpit.